A strain of the infamous Trinidad Scorpion pepper, the Trinidad Scorpion “Butch T” was once the hottest pepper in the world – holding the Guinness Book of World Records title in 2011. This is truly a global strain, crossing Trinidad, the United States, and Australia as the “Butch T” came into being. Of course holding the title of “World’s Hottest Chili Pepper” is often a fleeting thing. 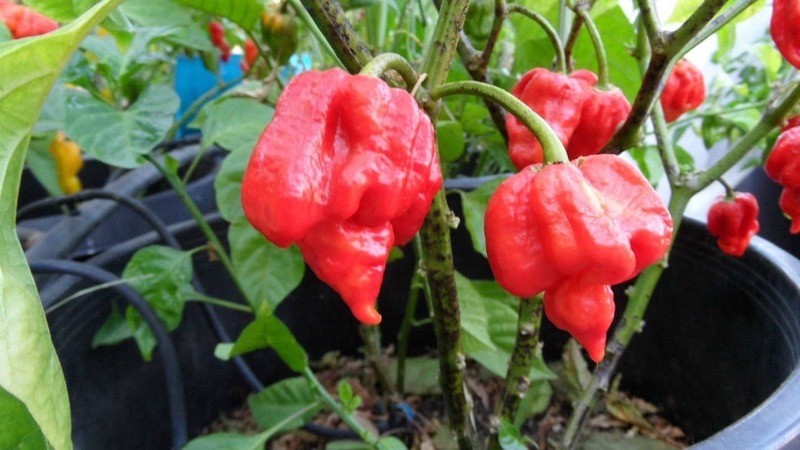 The Trinidad Moruga Scorpion and later the Carolina Reaper – with their 2,000,000 SHU heat – soon surpassed the “Butch T”, but the legend of this strain – and its global origin story – was born. It’s still widely sought after by extreme eaters for its mega-heat, fruity flavor, and wicked looks. How hot are Trinidad Scorpion “Butch T” peppers? Like all super-hots of this caliber, the “Butch T” is like a culinary solar flare – not to be eaten raw (or without a lot of dilution). They can reach just above 1.4 million Scoville heat units (SHU) at their peak, though there are many “Butch T” that fall within the ghost pepper heat range of 800,000 to 1,000,000 SHU. Compared to our jalapeño reference point, that’s 100 to 585 times hotter than a jalapeño. Comparing the “Butch T” to the Trinidad Moruga Scorpion: The Moruga Scorpion can reach near Carolina Reaper heights – close to 2 million SHU, though that’s not the norm. They tend to sit around 1.2 to 1.3 million SHU more often than not, and they rarely fall below 1.2 million. 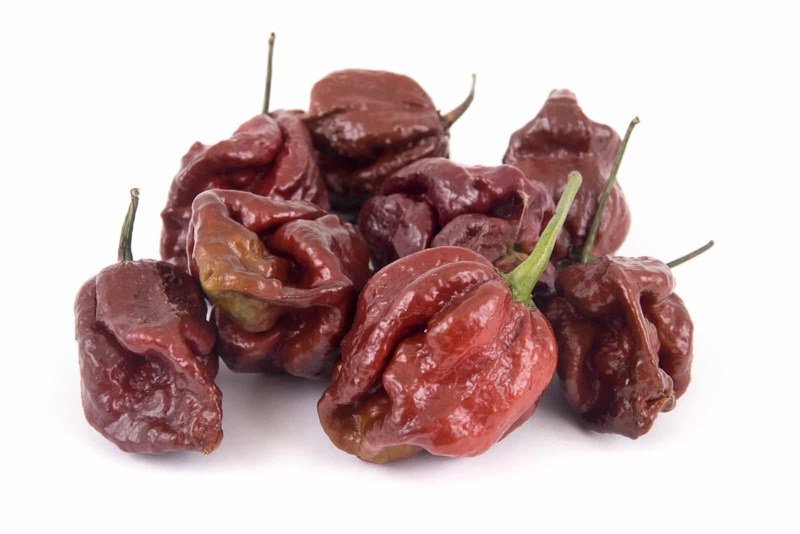 The “Butch T” Scorpion strain is often hotter than your typical Moruga Scorpion, but its floor is also much lower, so expect many instances where the “Butch T” is the milder option. Of course, this is like arguing the sharpness of two master blades. Either one will cut you plenty deep, and so it goes for either the Moruga Scorpion or the “Butch T” and their heat. Take extreme caution with the handling of either chili. What do they look like and taste like? As the “Butch T” is a strain, they share the same appearance as other Scorpion peppers. They grow to one to two inches in length with a bulbous, wrinkly appearance. And there’s that stinger. Scorpion peppers have a pronounced point, like a stinger, that certainly give them an edgy, dangerous look. In terms of color, these chilies age from green to yellow/orange to red – the typical pepper maturation pattern. Taste-wise, like most super-hots there’s a sweetness here – a fruity undertone that you can taste before the heat really hits. Scorpion pepper heat tends to come on faster than that of some other super-hots (like the slow-burning ghost pepper), so the fruitiness is short-lived. When the spiciness hits, it hits hard and becomes the real predominant flavor. How was the Trinidad Scorpion “Butch T” named? Some chilies are regional and their story has narrow focus, while others are more worldly. The Scorpion “Butch T” falls into the latter camp. 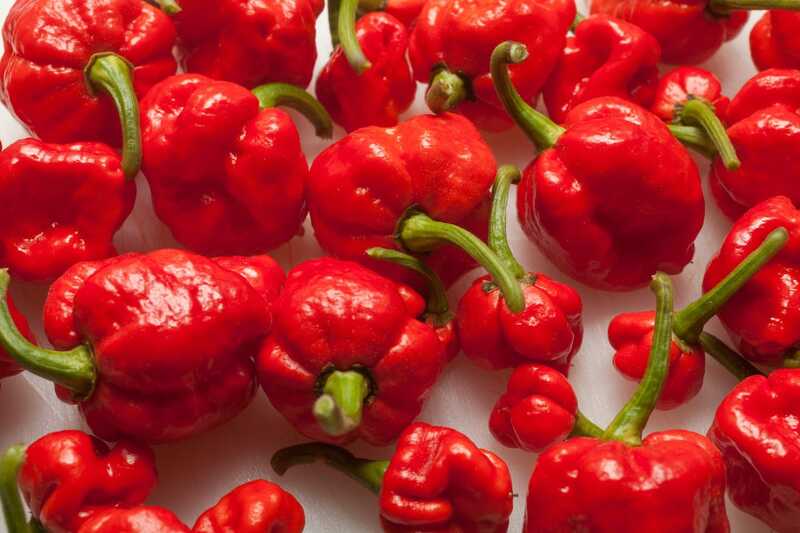 Scorpion peppers are originally from the Trinidad and Tobago region of the Caribbean. “Butch T” is short for Butch Taylor – the original creator of this strain. Butch is from Mississippi and the founder of Zydeco Hot Sauce. The chili was then commercially named by Neil Smith, from The Hippy Seed Company, and Marcel de Wit, from the Chilli Factory, both in Australia. Shared chili seeds are often marked in plastic bags with the type followed by the first name and last initial of the propagator – hence “Butch T” which was then marked as the name when tested for overall heat. How can you use “Butch T” chilies? As with other super-hots, these peppers are truly the focus of extreme eaters. Super-spicy hot sauces are a favorite and “Butch T” powders are available to heighten the heat of just about anything. But, as mentioned, extreme care must be taken. Chilies of this heat cause serious chili burn. Wear kitchen gloves and goggles when using, and know how to combat chili burn if it occurs. Where can you buy Trinidad Scorpion “Butch T” peppers? You can find “Butch T” pepper seeds, powders, and hot sauces widely available online. It’s not a chili pepper you’ll often find in brick and mortar stores – it’s just too spicy for the masses. If you’re one for extreme super-hot chili peppers, the Trinidad Scorpion “Butch T” pepper should be part of your vernacular. While it has been overshadowed by hotter chilies, it has the record-book pedigree few others enjoy and the wicked scorpion pepper look that just fits with the overwhelming heat.